I am feeling jittery and overwhelmed. Come next week, I have 2 snack boxes and 2 lunch boxes (3 when Jagan returns from his trip) to pack, a breakfast to make that not everybody hates, 2 spoilt little kids to ready for school, a tennis lesson for Hasini squeezed somewhere in-between and all this by 8:30 am!! Hasini’s school reopens next week. Terror Yuvi will also be starting school next week. Terror Yuvi is a mighty spiderman at home but wails the shrillest in school. I’ll have to be fanatically-prepared and extraordinarily organized none of which I am. And I’ll have to wake up early which my neural network has been unable to ‘get’ in its 30 year history. I tend to round off my age to the nearest lowest round number divisible by 10 to keep things simple and to feel better. There’s no better time to use my Meal planner than now. I created the meal planner at the beginning of the year meaning to use it every week but haven’t used it continuously. Now is the time. I need to plan my menu for the week, stock groceries and produce for the week and also prep them as far I can so that I can pull something out and finish quick. I need quick, healthy and tasty recipes. This Egg & Cabbage scramble is just the thing, perfect for lunch boxes too. It is super quick, tasty and most definitely healthy. My kids love eggs in any form and they love this one too. If you’ve never tried the combination, egg and cabbage may sound weird but try this one and you won’t be disappointed. Serve this scramble alongside variety rice, rolled in rotis with a little ketchup if your kids are the ketchup loving ones, with pooris or sandwiched between toasted bread, mayo and some fresh veggies. 1. Beat eggs lightly in a small bowl. Add turmeric and salt and beat till frothy. Set aside. 2. Heat 1 tbsp oil in a pan. Add the chopped onions and green chillies and sauté till the onions turn translucent. 3. Add chopped cabbage and mix well. Pour just enough water to cover the cabbage and onions. Reduce heat to low, cover and cook for 5-8 minutes or till cabbage is cooked. 4. Open and cook till the water dries up completely. 5. Beat eggs again lightly and pour into the pan. Use a spatula, quickly scramble the eggs and cabbage. Add another 1-2 tbsp oil and toss around, scraping the bottom and sides of the pan to loosen any pieces of egg. Cook for 1-2 more minutes or till your desired level of doneness. I like a few golden specks on my scrambled eggs, so I cook until then. 6. Remove from heat. Serve hot or at room temperature. 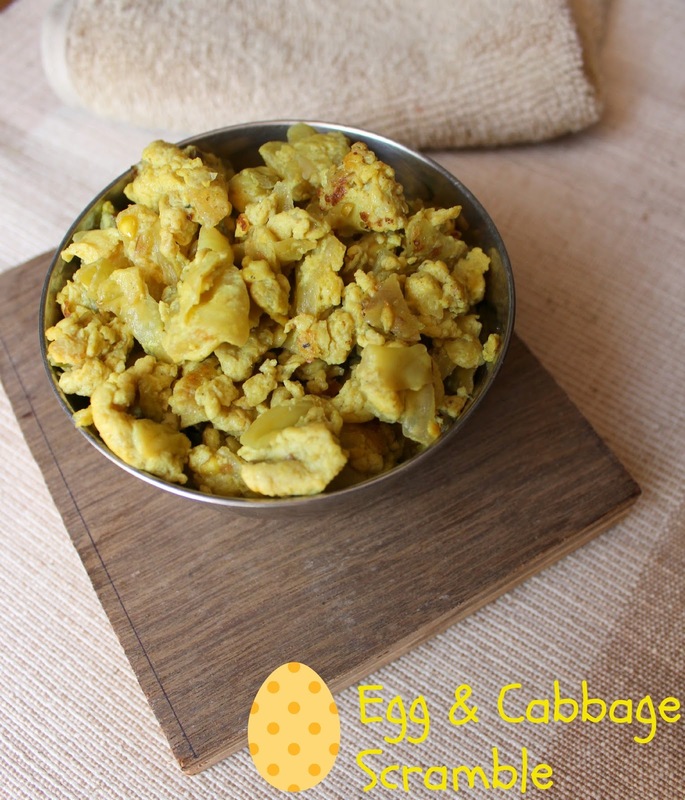 This entry was posted in Sides/Vegetables and tagged egg and cabbage scramble, egg scramble, kid friendly, lunch box dish, lunch box idea, muttai muttagose podimas, non-vegetarian, quick egg scramble, recipe, scrambled egg and cabbage.